Frame/Design – First, with the Kettler Champ 5.0 you get a 7/8 inch thick weatherproof sealed aluminum composite top – perfect for that ‘True Bounce’ that Kettler puts into their tables. The Cornilleau 250S has a 5mm resin laminate top and excellent bounce too. 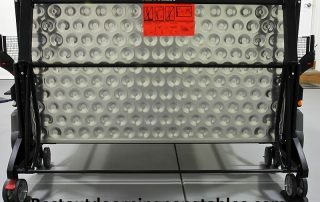 The ALU-TEC climate control underside is ideal for use in climates where there is moisture which might cause the table to expand and contract. 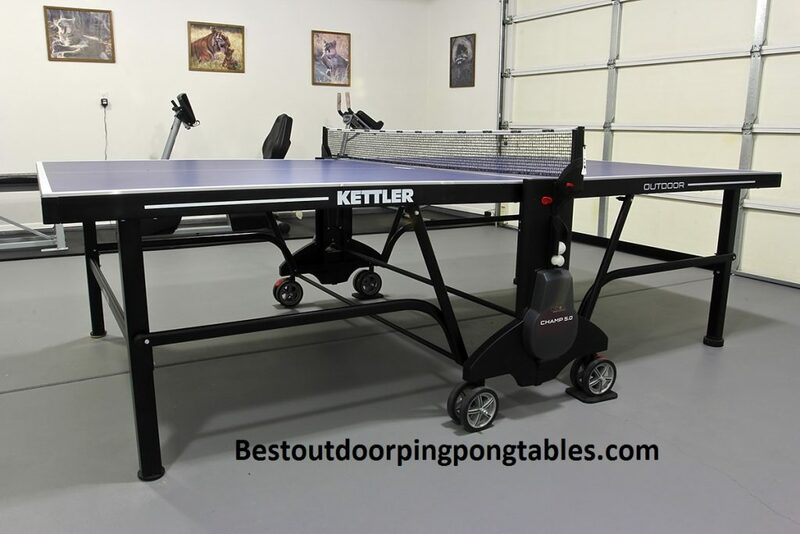 The Kettler underside keeps the table from warping or cracking due to weather changes. 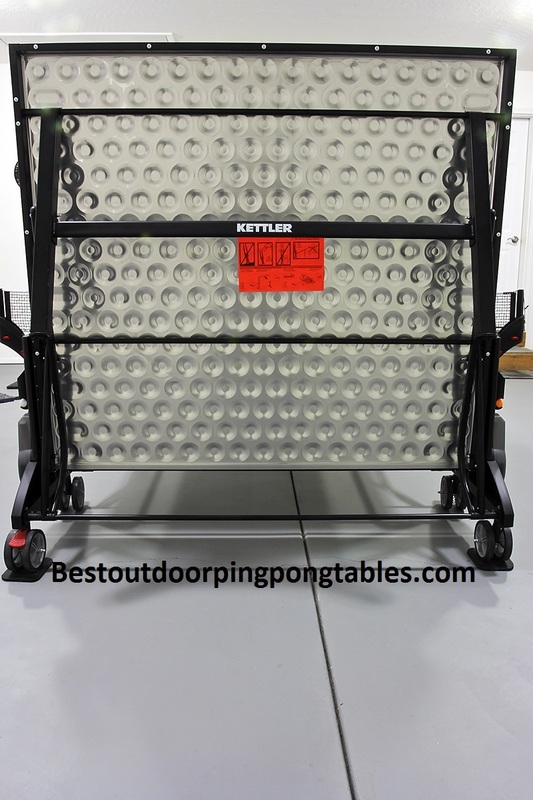 The 2 1/4 inch aluminum apron protects the edges and also supports the Kettler tabletop from warping. The blue playing surface has a topcoat finish that is scratch, fade, and UV resistant. In our opinion this table is built to last. Maybe not quite as long as the Cornilleau 250S, but the Kettler Champ 5.0 is designed to hold up just fine in all weather conditions. The Kettler Champ 3.0 is a cheaper option from Kettler, it offers many of the same features as the 5.0, but there are some differences. Mainly the frame design and wheels – they are not as durable. 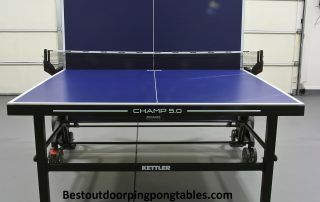 The Champ 3.0 from Kettler is not a bad table, but the Kettler Champ 5.0 outdoor features more heavy-duty parts. Assembly – Putting the Kettler Champ 5.0 together is easier than what you find on some of the cheaper Kettler outdoor tables, but still not as easy as the Killerspin (20 minutes) or Cornilleau tables. 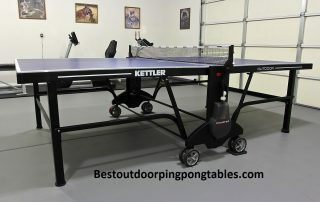 It took us 90 minutes to assemble the Kettler table and get it up and running. 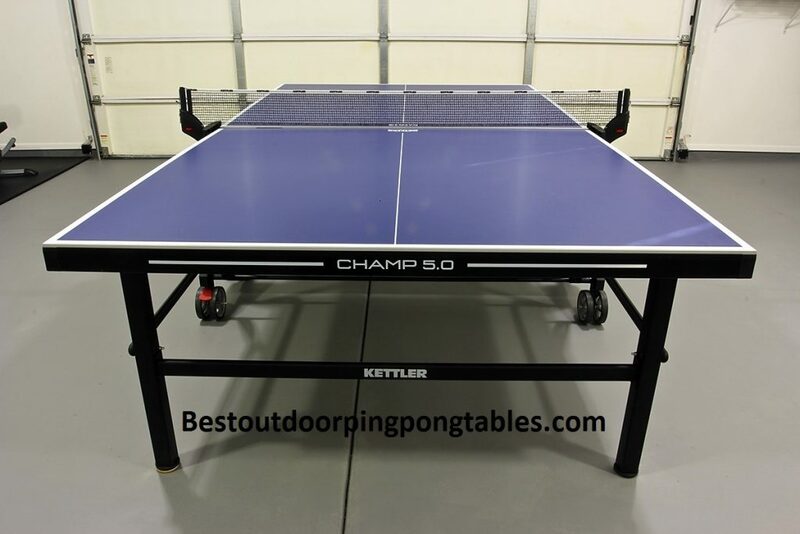 We realize that we have lots of experience when it comes to assembling ping pong tables, so we highly recommend watching the video we have provided on how to assemble the Champ 5.0. It will save you lots of time and mistakes. Our suggestion is to lay out all the pieces and follow the video/manual as close as possible. 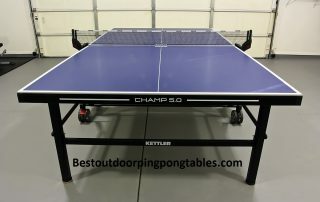 The table is beautiful once assembled, so stay patient and you shouldn’t have any problems. 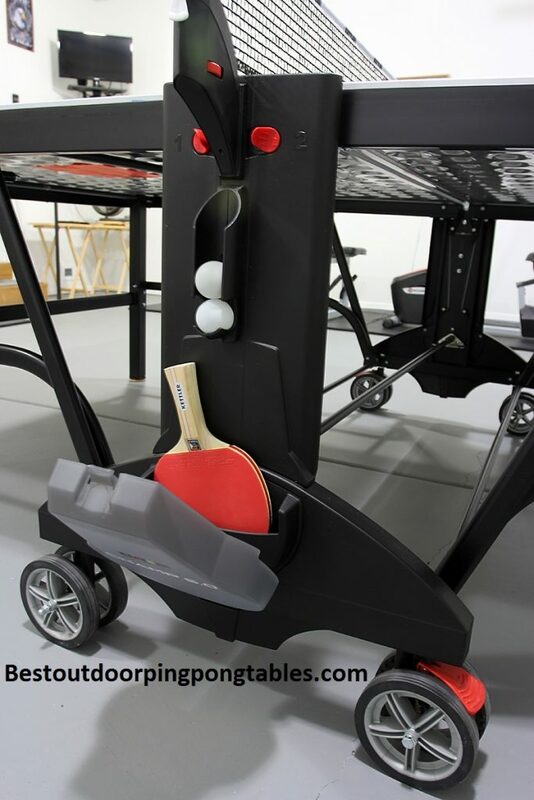 Playability – We like that the table is convenient to open and close and ready to play in less than a minute. 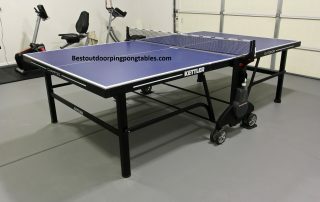 The playing surface is a weatherproof sealed aluminum composite top and ping pong balls rebound nicely off the surface. You can quickly put the table into playback mode and practice your skills against one side of the table. 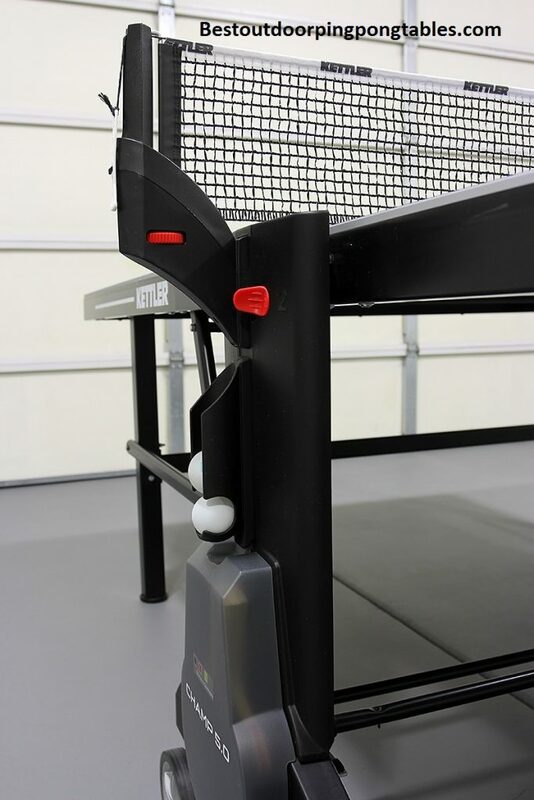 There is also an area to keep your racquets and ping pong balls – very convenient. 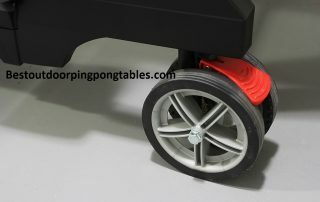 Legs have levelers so you are guaranteed to be playing on a level surface with a few adjustments. 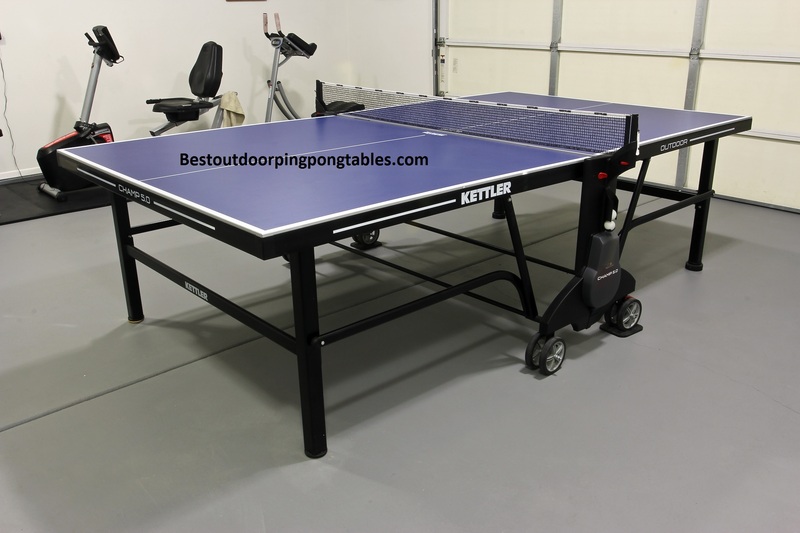 Not all ping pong tables offer this features, but the high end tables like the Cornilleau 250S and 500M do as well. The Kettler Champ 5.0 plays as cleanly as you would like. 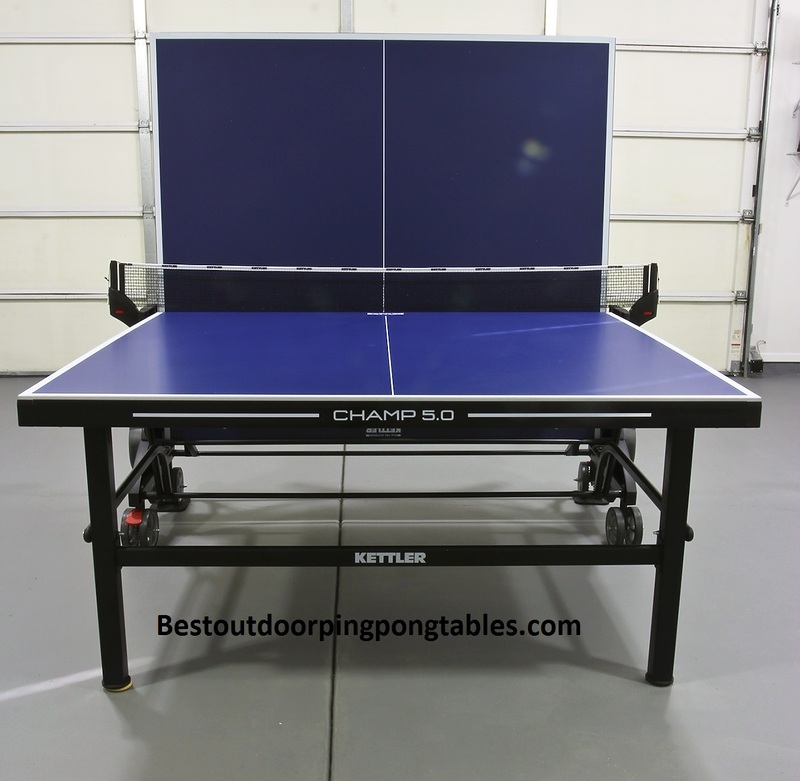 We’ve had years of practice on the Kettler Master Pro and if you look at the table design and features on the Champ 5.0, it’s almost identical to the Master Pro. The only differences are the color to the frame and tabletop surface. 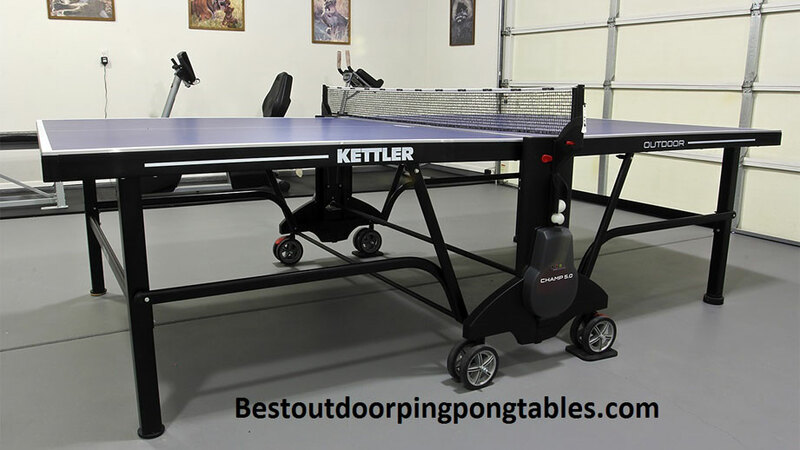 This is an outdoor ping pong table built to last in the elements and provide consistent play for all ability levels. 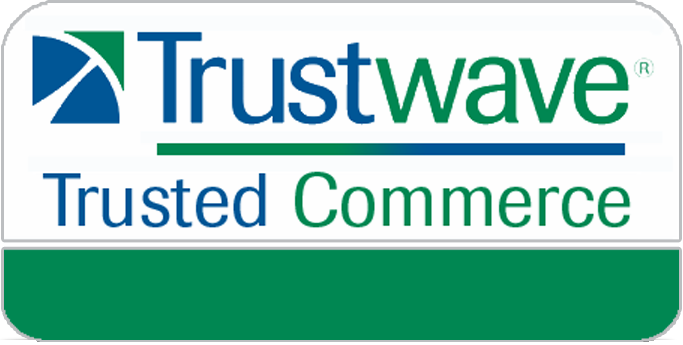 Storage/Moving – Storage is pretty compact – we put ours to the corner of our warehouse when not in use, but we do put a cover on it much of the year. The 6 inch swiveling transport wheels make moving it easy and you can use the integrated locking systems to secure the table in place once you have it where you want it. The table has a low center of gravity, so moving it is quite easy. You can see in our photos that the legs fold right up and fit snugly against the tabletop surface. 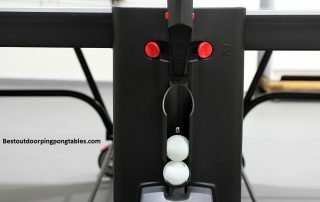 Safety Features – Folding the table up and down is really easy, the Kettler Safety-Track folding mechanism (watch the video to see it) couldn’t have been simpler for us. The safety features keep the table from opening or closing accidentally – nice touch for families with kids. Not much in terms of corner protection (padding) on the table. 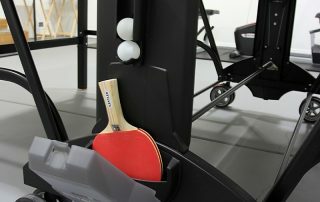 It’s still better than other tables we’ve played on but not as high quality as the Cornilleau 500M. 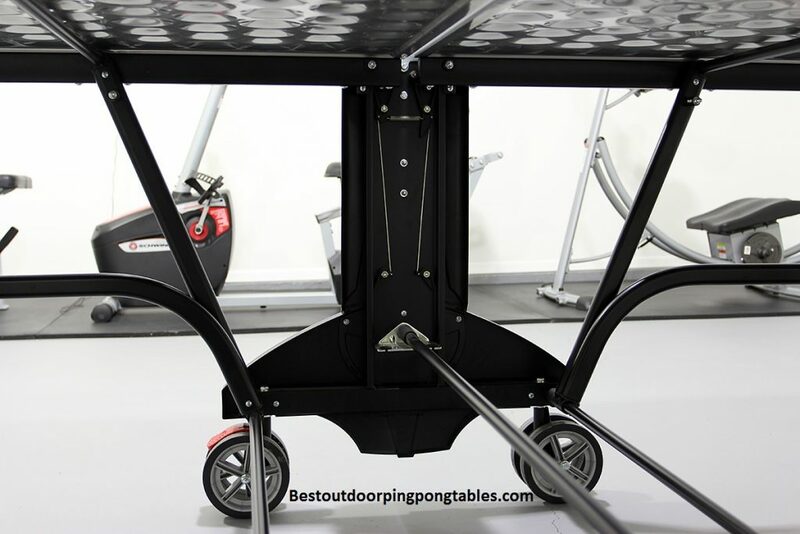 Disadvantages – We feel like the wheels could be slightly more heavy duty given the table has to be mobile in the outdoors. You could potentially be going over rocks, dirt, etc. and the wheels seem a bit flimsy (plastic). It’s got some stiff competition from the Cornilleau 250S which has a superior rating in our eyes and for the price may be a slightly better purchase. We still really like the Kettler Champ 5.0 and would definitely recommend it to all our customers.